Welcome to Dubai, where it’s sizzling hot outside and chilly inside. 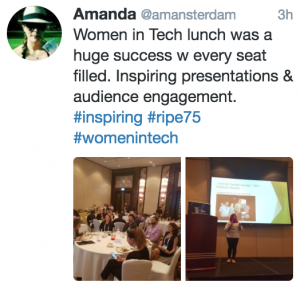 We welcomed 387 attendees by the end of the first day of RIPE 75. 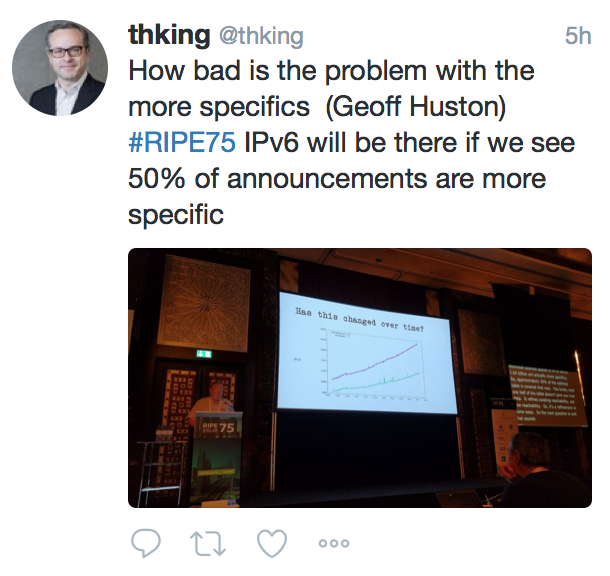 A look at the state of IPv6: dual-stack is the half-way point, IPv6-only in 2017 is where dual-stack was in 2011 and does “IPv6-only” include transition? 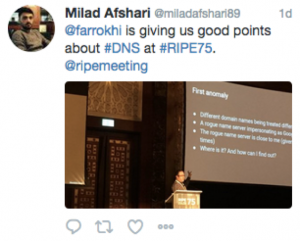 Later, attendees gathered by the pool to enjoy the warm Dubai evening for a Meet the RIPE NCC Executive Board social and the RIPE 75 Welcome Reception. 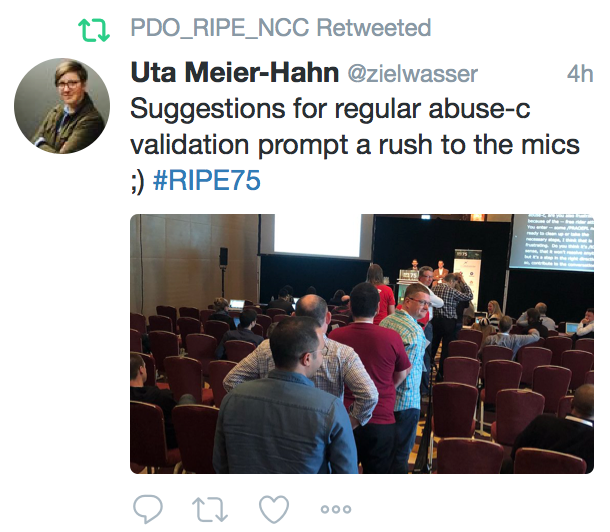 There were 483 attendees checked in at RIPE 75 for another full day of RIPE Working Group (WG) sessions. 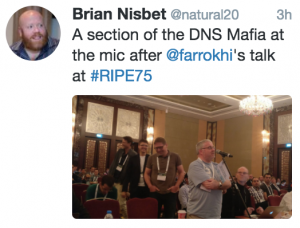 A discussion about the charter of the WG with support at the microphone for more focus on the IETF, IXPs and BGP security. 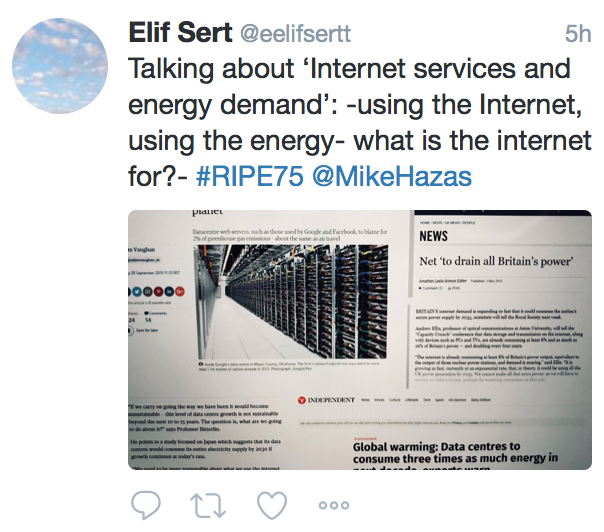 The day’s programme ended with a workshop on configuring CPE for transition mechanisms. 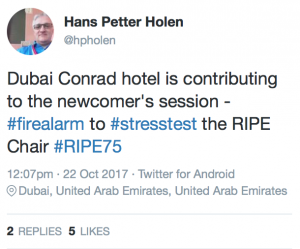 Attendees then boarded buses and headed off to the final social of the meeting week, the RIPE 75 Dinner at the Dubai Marine Resort. 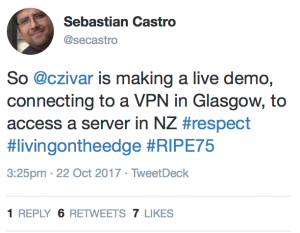 See you tomorrow for the last day of RIPE 75. 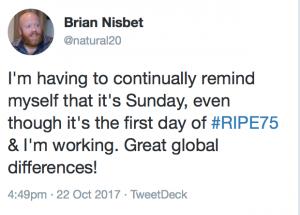 A special emphasis on funds dedicated to community/industry development – including women in tech initiatives – in the various RIR service regions: AFRINIC (FIRE Africa), APNIC (APNIC Foundation), RIPE NCC (RIPE NCC Community Projects Fund), LACNIC (FRIDA regional fund for digital innovations). A description of activities to increase awareness of, and enhance participation in, the Policy Development Process. 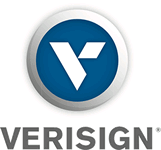 An epic journey through SUNET’s comprehensive renovation of a Swedish fibre network. 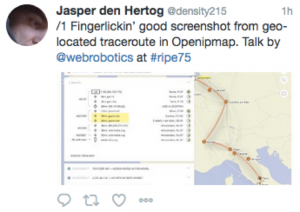 A description of Akamai’s traffic optimisation via the implementation of a multiservice backbone solution. 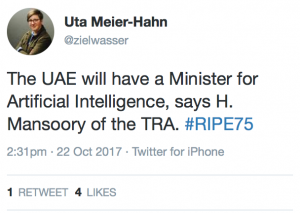 A peek into the specificity of UAE customs codes, and the joy of surprise power outages due to vacuum cleaner interference. 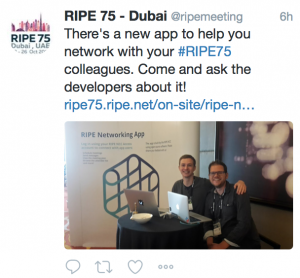 RIPE Networking App (totals for the week): 251 participants; 561 messages; 741 meetings! 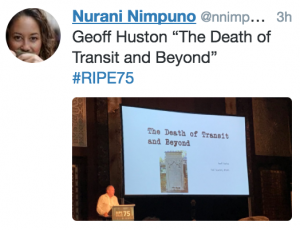 Elise Gerich, VP of ICANN and IANA/PTI, NANOG co-founder and beloved community member, announced her retirement. 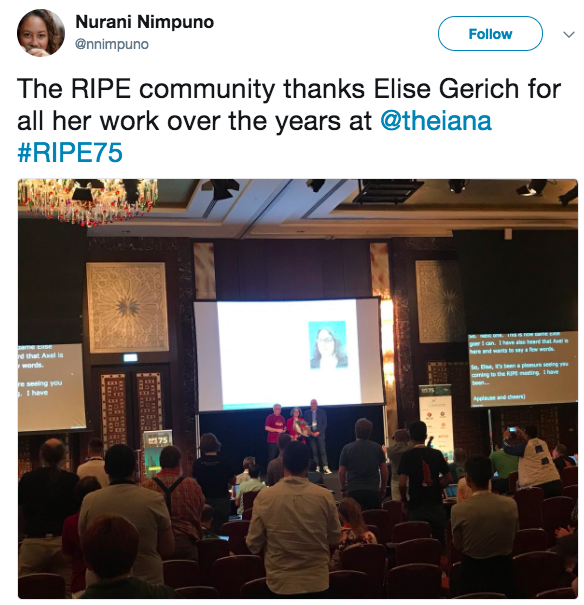 Hans Petter Holen, on behalf of the RIPE community, thanked Elise for her many years of service. 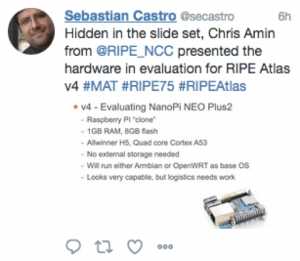 Hans Petter Holen announced the IoT WG Proposed Charter and the RIPE Diversity Task Force Draft Charter. 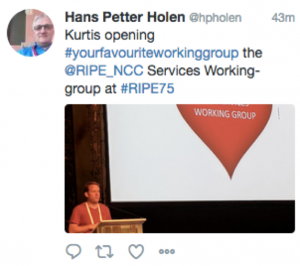 The RIPE NCC Executive Board appointed Hervé Clément as NRO NC representative from the RIPE NCC service region. 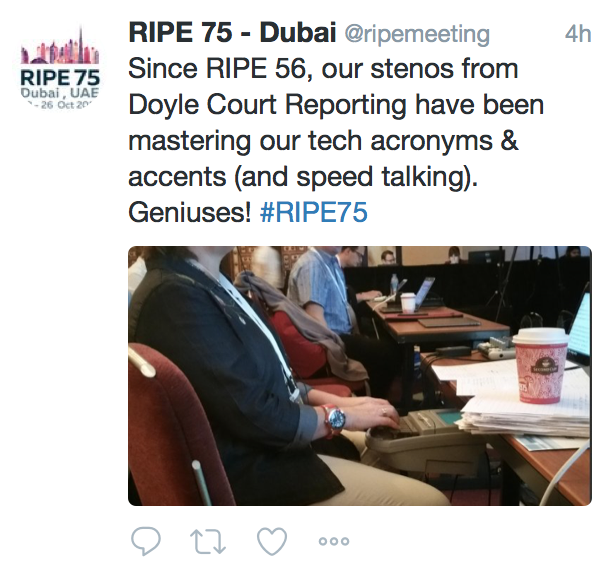 Thank you for making RIPE 75 a success. 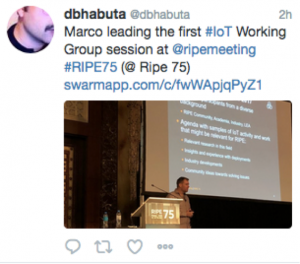 See you all at RIPE 76 in Marseille from 14-18 May 2018.